The 2018 MetaSprint Series ended yesterday with a hugely competitive MetaSprint Triathlon, which saw defending champion Colin O’Shea clinch the men’s title with a scintillating time of 58 minutes and 30 seconds. As fast as his performance was, though, it wasn’t enough to win the Champion of Champions crown, that honour going to Jennifer Zenker, who put in a dominating wire-to-wire performance to not only defend her women’s title but also hold off all the men for the second year in a row. Now in its 11th year, the MetaSprint Series shows no sign of losing its appeal with almost 2,000 competitors and hundreds more supporters and spectators flocking to the race village yesterday on what was a beautiful Sunday morning at East Coast Park, the traditional home of triathlon in Singapore. As well as the sprint-distance contests which give the MetaSprint Series its name, also on the program were the usual Discovery, Youth and Kids races, and new for this year the Kids Scootathlon. The series truly is “a fun way to be a triathlete”. The elite women’s wave kicked off yesterday’s action at 7:40am. The leading ladies started five minutes and 45 seconds ahead of the men’s elite wave; this time gap, or “Equaliser”, is what sets the tone for the Champion of Champions element of the series. The Equaliser is calculated on the difference between the men’s and women’s winning times in the previous three years races. With clear blue skies but relatively cool temperatures (at least for the early waves) and no wind, the land conditions were perfect for racing. The flat sea seemed perfect too, but beneath the still surface lurked a relatively strong current, which played into the hands of the strongest open water swimmers. Such as Zenker. The German cut through the current like it wasn’t there to hit the beach first after the 750-metre swim. Her split of 11:34 was 47 seconds faster than the next girl out of the water, Sam Mcinnes. April Rice was third, a further 50 seconds behind. A reflection of how good Zenker’s split was the fact that only seven men swam faster than her. Swim done, Zenker tore through T1 and onto the bike, which if anything could be the strongest weapon in her arsenal. She covered the three-lap, 18km bike course in a shade under 28 minutes, a feat that saw her extend her lead to some 5 minutes heading into T2. Mcinnes was still her closest challenger off the bike, but only by a matter of seconds now from Rice. Onto the 5km run and Zenker’s win in the women’s race was virtually assured, the only unanswered question was whether or not she could hold off the men. She managed this with aplomb, her winning time of 1 hour, 3 minutes and 20 seconds bringing her home almost a minute clear of her male rivals. The defending women’s champ could even afford to take her feet off the gas on the run, but behind the battle for the podium places was heating up. Charging through the field was Emma Middleditch and after just the first of the two run laps she had made up a minute’s deficit on Mcinnes and Rice. She didn’t stop there and went on to record the fastest women’s run split of 18:56. This left her three and half minute behind Zenker but a minute clear of Mcinnes, who held off Rice to claim the final spot on the overall podium. With Zenker not taking part in either this year’s MetaSport Sprint Series Aquathlon or Duathlon, she wasn’t eligible for the 2018 overall series title. This is calculated on a two-out-of-three basis, with points earned in the Triathlon and either the Aquathlon or Duathlon. The 2018 women’s overall series champion was Middleditch, her second-place finishes in the Aquathlon and Triathlon being enough to clinch the crown. Post-race, the smile on Zenker’s face said it all. “Of course I’m very happy to have won the race and defended my title. It’s a great race and it was good to be back,” said Zenker, who also revealed that she didn’t really notice the current in the swim and explained that she’d missed the opening two legs of the series due to taking an extended break from training after a hard racing year in 2017. But she’s back in training with a vengeance now and is targeting next month’s Bintan Triathlon, another MetaSport event in which she’s the defending champion. “I’ve got my eye on the Olympic Distance course record, which I just missed by 9 seconds last year,” she said confidently. While Zenker’s win was a dominating one, O’Shea’s victory in the men’s race was anything but, as a stellar field of Singapore’s top triathletes engaged in an epic battle. Among the talented lined up on the beach with the Irishman were 2018 Aquathlon winner Tim Cosulich, 2018 Duathlon champ Alan , IRONMAN legends Arnaud Selukov, Mark Jansen, Assad Attamimi and James Middleditch, and the local young guns from Second Wind Academy, Aaron Kiss, Cedric Chua and Zacharias Low. For those familiar with the multisports scene in Singapore it was no surprise to see the youngsters coming quickly to the fore during the swim leg. A pack of six athletes separated themselves from the rest of the field, with O’Shea the only “veteran” making the selection that also contained teenagers Kiss, Luke Chua, Russell Liew and Nicholas Rachmadi, as well as the 20-year-old Low. It was Luke Chua who hit the beach first a mere 10 minutes and 58 seconds after the starting gun fired, with Kiss and Rachmadi close on his heels. O’Shea faced a manageable 10-second deficit, but the rest of the field was strung out behind, with only Cosulich of the remaining pre-race favourites within a minute of the early leaders going into T1. The trio of teenagers stayed at the front of the race for the first of the three laps on the bike, but O’Shea was beginning to find his cycling legs and moved into the lead during lap two. The Irishman steadily pulled further ahead but two rockets were coming from behind in the shape of Cosulich and Selukov. Such was their speed on the bike that by the time O’Shea hit T2, it was the Italian and the Frenchman who followed him into transition, both around 20 seconds back. Onto the two-lap run and it didn’t take long before that lead evaporated completely, with Selukov making the catch around the 2km mark. O’Shea and his new co-leader were now matching each other stride for stride, with Cosulich lurking just seconds behind. But shortly after the turnaround for the final lap, the Irishman put in a little dig that Selukov couldn’t respond too, and he began to pull away. Heartened by the gap, O’Shea strode on strongly to take a hard-fought but well-deserved victory. The minor podium positions were still up for grabs but the expected battle for second between Selukov and Cosulich instead turned into a lovefest as the long-time friendly rivals showed their respect for each other by crossing the line together hand-in-hand. O’Shea was understandably ecstatic with his race-day victory and the overall 2018 MetaSprint Series title that came with it. “I’m really happy with the win and it’s great to defend the crown from last year. But it was an incredibly tough race and the competition this year was absolutely fierce,” said O’Shea, who unlike Zenker definitely noticed the current in the sea. “There was quite a bit of current in the swim there, moving from left to right, you could see that through the buoys. The swim was very fast taken out by some of the local Singapore guys, so I just tried to find some legs and I just managed to make it around,” he added. Did O’Shea at any time think he could catch Zenker in the Champion of Champions battle? While the elite athletes were swapping race stories, the rest of the huge contingent of athletes were either still on course or making final preparations; there were 32 different wave starts across all the events on the race card. Of the almost 2,000 competitors, some 20 percent were taking part in their first triathlon, while 52 nationalities and 68 schools were represented. Every single one of the participants will have their own special story to tell about their race-day experience, such as Eugene Ranada. The Filipino has shed 40kg in weight over the past two years and yesterday took another step in his on-going journey to health and fitness by completing his first ever triathlon. High performance athletes from other sports such as ex-Olympian rowers, rugby players and synchronized swimmers were well represented on Sunday, getting their competitive fix. But a story of extra-special note from yesterday involved one of the elite athletes, Aaron Kiss. Noticing that fellow competitor Jack Heneberry seemed to be in trouble during the run leg, Kiss stopped to offer assistance. Considering the young Australian was still racing at the pointy end of the action when the incident occurred, it was a supreme example of sportsmanship. Being a family-friendly concept, the MetaSprint Series has always had its fair share of siblings racing together, with the elite-level Middleditch sisters Louisa and Emma, and the Yong twins Valerie and Vanessa, being the most prominent in recent years. But yesterday saw a first when a set of triplets entered the Youth races – the Long’s from Malaysia. While Nicholas and Matthew performed admirably in the boys’ race, their sister Kelly stole the family limelight by taking first place in the girls’ 12-13 sub-category. Joining the Long’s yesterday were 131 other Youth participants. Open to 12-to-15 year-olds, the Youths raced over the Discovery distance, which incorporates a 250m swim, a 12km bike and a 2.5km run. These Youth races always been hugely inspiring and highly competitive affairs over the years, and it was no different yesterday. The fastest male Youth yesterday was Nigel Ng from Malaysia, who after being in a head-to-head with Matthew Trott over the first two legs, pulled away on the run to claim a comfortable win in a time of 35:40. Trott from Britain was second, with another Malaysian Darrell Zhou in third. Enola De Smet was the overall female Youth champ, with a time of 41:48, although the Belgian girl had to come from well back after the swim and bike to catch, then pass the early runaway leader, Tania Thong of Malaysia. Thong held on for second, with Bella Shroff of the USA coming through as the third-fastest girl. The youngest triathletes competed in the Kids events for boys and girls aged 8 to 11; in total, 190 of them signed up to race and they were tasked with completing a 150 swim, a 6km bike leg and 1.5km run. Daniel Louw from Australia enjoyed a ding-dong battle with Singaporean Mike Lee before emerging as the boys’ champion with a time of 26:15. The third-fastest boy was Julius Groenewegen from the Netherlands. A special mention, though, to Hugo Tan, who racing in the 8-9 sub-category, just missed out on the overall male Kids 1, 2, 3 by a few seconds. Perhaps even more notable was the fact that the best girl in the Kids events, Eliza Tan, actually recorded the third-fastest time across both genders and was only 17 seconds slower than boys’ winner Lee. The boys and girls race in separate waves, but it might have been interesting to see young Ms Tan go head-to-head with the boys. Joining Tan on the girls’ podium were Marion Meize of France and Sophie Schwalb of Germany, with the former claiming the runners-up spot by less than a second! Rounding out the action yesterday were the youngsters of the Scootathlon. Open to 3-to-8 year-olds, 72 of them had loads of fun blasting their way round a 500m-scooter course followed by a 200m run. Full results from yesterday’s MetaSprint Triathlon can be found at www.metasprintseries.com/race-results. Overall series rankings across all the events, categories and genders can be found on the website too, and among the notable highlights from that slew of data are MetaSport clinching the Overall Club Series title and Marlborough College capturing the Overall School Series crown. 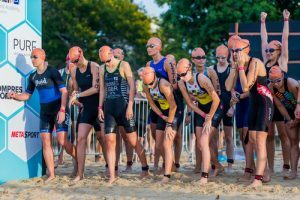 While the MetaSprint Series won’t return until February 2019, top-class multisports action continues next month with the Bintan Triathlon festival from May 11-13. Go to www.bintantriathlon.com for full information about and to register for Asia’s premier triathlon event, which features the Swim Classic, the Sprint Distance, Youth, Kids and Fun Duo contests in addition to the blue ribbon Olympic Distance race on the Saturday afternoon. Note, prices increase on April 18. The next MetaSport event to take place in Singapore is the City60 Bike-Run Challenge on October 7, Registrations for that exciting city-centre event open next month at www.city60bikerun.com. Also, to be launched this week is the CSC Run By The Bay, scheduled for October 20, a popular running event organised for the first time by MetaSport this year. Expect a few interesting twists, including a sunset start, an age-group ranking and a new 12.8km round-the-reservoir loop, added to the standard 21.1km. All content Copyright © Metasprintseries 2019 All rights reserved.